Coming up with blog post ideas can be tough. It’s not that I don’t have ideas, but I want the RIGHT ideas. What do people want to know? How can I write a post that brings more traffic to my site and more subscribers to my list? 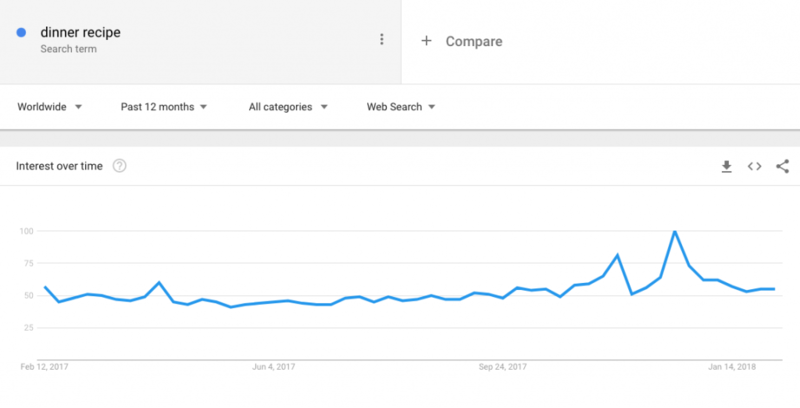 I feel like I have a pretty good handle on blog post writing – and I’m going to let you in on one of the tools that I personally use all the time to help me come up with great content – Google Trends. 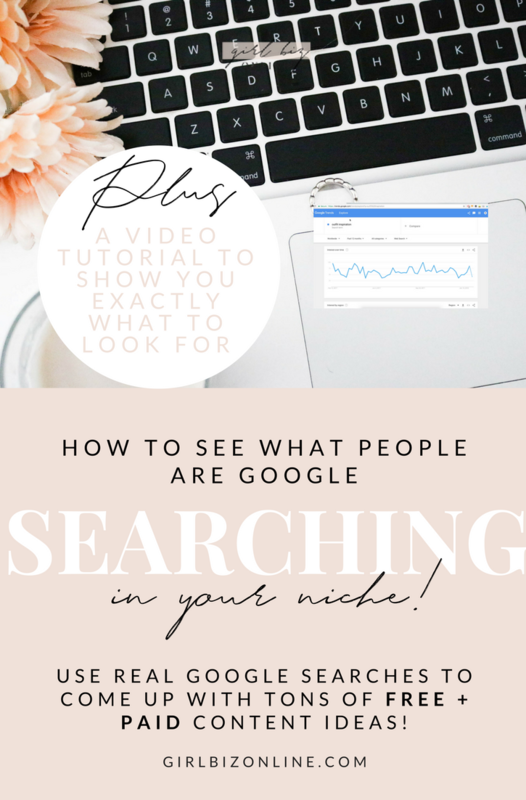 This allows to you take real Google searches and turn them into ideas. Now onto the searching! When you go to the Google Trends homepage, trending topics will already pop up. These are the most popular searches worldwide right now – pretty mind blowing. But we want to get more specific, so you’ll need to think of some ideas of what your audience might be searching for. This is the first screen you’ll see – let’s look at Interest Over Time. Interest over time is a good one to look at, especially if you’re just thinking about starting your blog. You don’t want to pick a topic with declining popularity. If the slope is trending downwards, you might want to skip this search term because it’s getting less and less interest. You would definitely want the slope top be flat or positive. A flat slope might actually be the best because you know the content interest remains steady – instead of spiking because it’s trendy and then crashing hard once the trend dies. Use your common sense when choosing ideas! Dinner recipe, for example, is pretty flat – which is good! People are always going to need to eat dinner so this topic works year round and it doesn’t look like it’s going anywhere. It’s a safe bet to spend time creating content around. This is something I don’t really look at because I get traffic from all over the world – and you probably do too! But my main audiences are the US, Canada, and Australia – so if I wanted to get more specific into my demographic, I could. This would be crucial to a local business, so if you’re a photographer shooting in Canada, you might want to narrow down on this location to see what your ideal customer specifically wants to read. 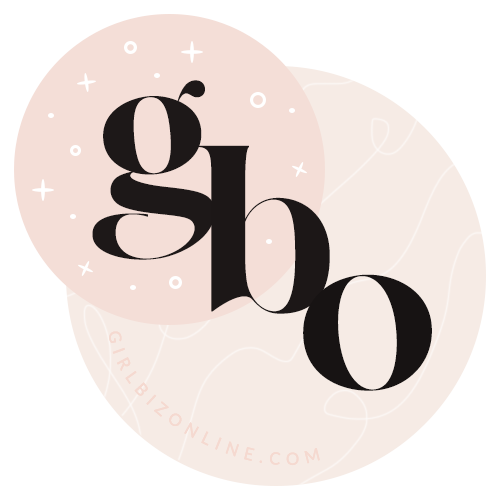 Scroll a little further and you get into the two tools that I LOVE and always go to for guidance – related topics + related queries. I’ll get into these in a second but it’s important to note that you can toggle between the Rising related content and Top related content. Top related is obviously things with the highest search volume – this is the most important section to look at. What are people searching the most? Rising might not necessarily be the most searched but it is the fastest increase in interest – meaning this is what people are searching more than ever right now. Top content is my favorite to create around because it’s probably evergreen – meaning I can write the post and it will still bring me steady traffic for months or years. Evergreen content should be the pillar of your blog. BUT that doesn’t mean to ignore trends. This type of content can bring huge traffic spikes to your blog if you capitalize on it. For example, specific posts about Christmas won’t do well all year round BUT can bring lots of visitors around the holidays. You definitely want to pay attention to trends – just not to make all of your content trend-related or your blog topic attached to a declining trend. 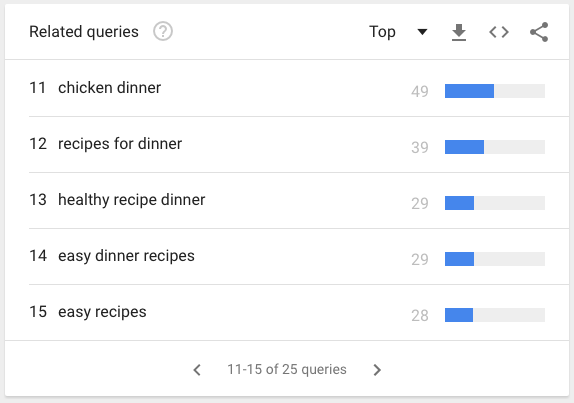 These are topics commonly searched that are related to dinner recipes. I like looking at related topics because it can help you get more specific. 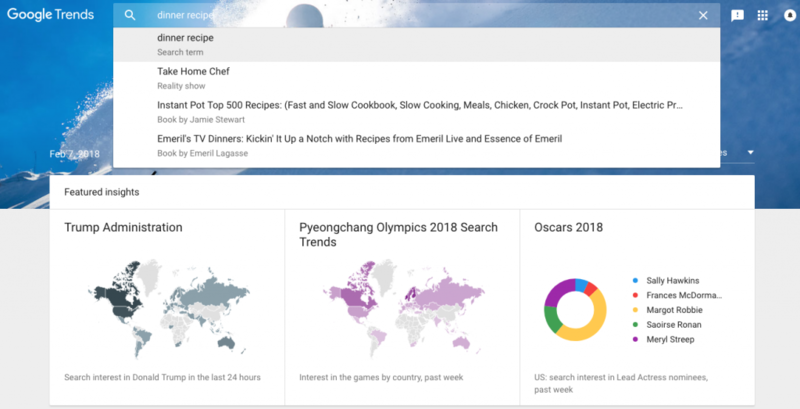 If you’re thinking “I want to post a new dinner recipe, but I need an angle”, topics can solve that problem. In the trending related topics, ketogenic diet is really rising. This is definitely something I would consider if I were a food blogger – maybe I should be looking into more keto related posts. In the top related topics, I can see chicken. Chicken recipes will probably always do well – so I should definitely have an arsenal of chicken recipes and if I’m stuck for ideas and need something quick, a chicken dinner recipe is probably a safe bet. I definitely see some helpful info in the related queries section. Speaking of a ketogenic diet – I see more keto trends in the rising related queries. If I were a food blogger, I would definitely be looking into capitalizing on this keto trend if that’s what people are searching for. Again, let’s look at the Top – it’s super important to me because these topics have more longevity. I’m seeing “chicken dinner”, “healthy dinner recipe”. “easy dinner recipes” – all GREAT keywords that I can use in blog post titles and try to rank for. I might create a series around one of these topics, make a course of all easy dinner recipes. And for my next search, I would 100% dig deeper into the search terms for these – if I click on them, it will bring up a whole new page of information that I can use to get even more specific. What did I learn here? A lot! If I was a food blogger, I would have some really good ideas for blog posts – I know that there are 3 major things people are looking for in their dinner recipes: chicken recipes, healthy recipes, and easy recipes. I can actually tailor my WHOLE blog around this concept – easy and healthy recipes. And these are also keywords I should be using and targeting because they’re clearly attractive to someone looking for new dinner recipes. I also know that a ketogenic diet is on the rise – and although I may not want to make my blog totally about keto foods (in case this trend doesn’t last), it looks like I might be able to capitalize on this trend by doing some keto diet and recipe posts. 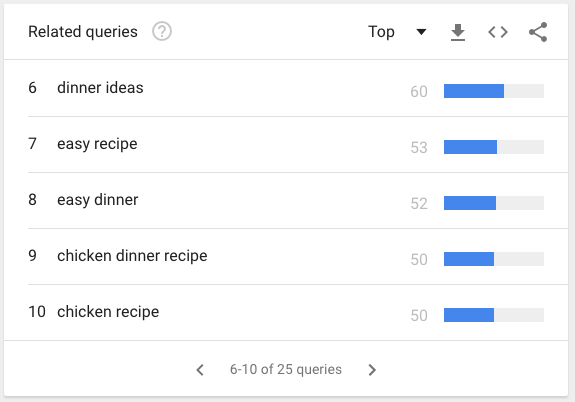 This was a pretty general search – usually I would search a few more terms to get even more ideas – but already, in less than a few minutes, we’ve analyzed some really valuable information you could use to improve your dinner recipe posts. And the tool was totally free. I call that a win! Want to see me do this search in real time? 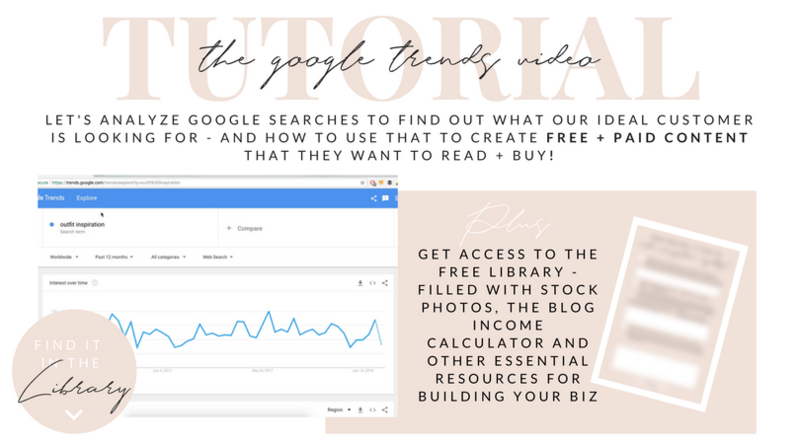 I put a tutorial in my Free Library – I go over how I read these insights if I were a style blogger looking for some new content ideas!